Manufactured since 1952. This pole was designed and is used by animal control professionals and other animal handlers throughout the world. The pole is famous for it's versatility. The animal can easily be rescued with an extension pole. When retracted, it may be used as a heavy duty restraining device. Most usefull in confined areas for handling of small animals. Type 1 91 Aircraft Grade Aluminium Used mostly for handling cats and small dogs. Type 2 122 Aircraft Grade Aluminium Most popular for general use. Type 3 152 Aircraft Grade Aluminium Popular because of its additional length and larger noose. Type 4 122-183 Aircraft Grade Aluminium Extended, it is used when additional length is needed. 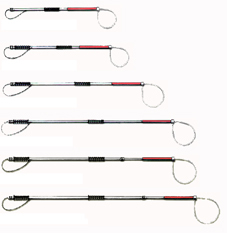 Retracted, it is used as a heavy duty training pole. Type 5 213-366 Aircraft Grade Aluminium When extended, it is used for rescuing animals from waterways, trees etc. Retracted, it is used as a heavy duty training pole. Type 6 122 Stainless Steel Constructed for Heavy Duty. Type 7 152 Stainless Steel Constructed for Heavy Duty.